Andrew “Andy” V. Waters is an associate in the firm’s New Orleans office where his practice primarily consists of representing and advising multinational shipping companies, insurers, and underwriters in matters regarding international law and maritime and admiralty litigation. Andy assists in litigating suits that arise out of vessel collisions and allisions, cargo claims, charter party disputes, personal injuries, and regulatory matters. His litigation practice also includes general insurance defense, such as property damage claims and insurance coverage issues. Andy regularly assists clients in navigating complex regulatory issues by interfacing with government agencies such as the United States Coast Guard, Office of Foreign Assets Control, Customs and Border Protection, and the Department of Commerce to mitigate potential liability arising out of business operations. Andy graduated from Tulane University’s A.B. Freeman School of Business with a B.S.M. in both Finance and Legal Studies in Business. He earned his J.D. from Tulane Law where he received a Maritime Law Certificate for concentrating his studies on admiralty and maritime classes. 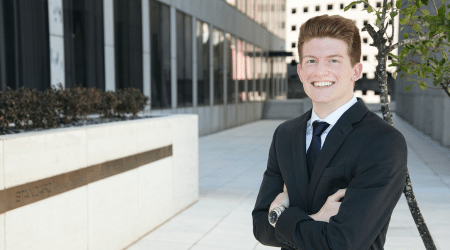 During law school, Andy participated in student government by serving as class president, Executive Social Chair, and eventually as Executive President of the Student Bar Association. Andy was a Managing Editor of the Tulane Maritime Law Journal, and he was a student-attorney in the Tulane Civil Litigation Clinic where he represented indigent clients in civil rights issues on a pro bono basis. Additionally, Andy helped international graduate law students sharpen their legal skills by serving as the Legal Research and Writing Senior Fellow for International Law Programs. Upon graduating, he received the Tulane 34 Award, which is presented to 34 Tulane University graduates who have distinguished themselves during their time at Tulane by virtue of their exemplary leadership, service, and academic excellence. Andy strives to offer practical solutions that are tailored to meet each individual client’s objectives. He understands that no two legal issues are the same, and with this in mind, he works aggressively to help each client achieve positive outcomes.